GLTC Taking Shape, says local news! 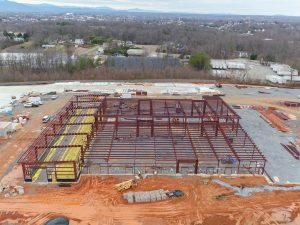 Both Peggy Whitaker, President of the Board of Directors for the Greater Lynchburg Transit Company, and Josh Baker, GLTC’s General Manager, are pleased with the progress of the 50,000 square foot facility. Scheduled for substantial completion at the end of 2016, the project is currently under budget despite weather challenges, and an unexpected amount of rock at the site. Read the full article here to learn about LEED accreditation plans for this facility.